PRESIDENT Emmerson Mnangagwa yesterday said his government would introduce a range of measures to boost the country's dwindling exports, fight corruption and cushion the local manufacturing sector to set Zimbabwe's fragile economy on a firm recovery trajectory. In his inaugural State of the Nation Address (Sona), delivered to a joint parliamentary sitting at the Harare International Conference Centre, Mnangagwa said his government would also ensure the country's next general elections - due in 2018 - would be free and fair. "My government is very conscious of the challenges facing the economy. It will focus on drastically reducing budget deficit and increase forex generation among others. The goal of my government is to build a new government on the crown of honesty, accountability and transparency," Mnangagwa said. "Economic growth prospects in 2018 remain favourable following a good 2017 agriculture season buttressed by scaled-up agriculture financing. Hence the economy is focussed to grow in 2018 supported by the rebound in agriculture and mining sectors. "The steady growth in the mining sector continues to be primarily driven by substantial output increases of gold, nickel, platinum, chrome and coal among other minerals." Mnangagwa said his government will be based "on crown values of honesty, transparency and hard work". He said he would tackle corruption, which is now endemic in the country. "Every corruption case must be investigated and punished accordingly. No sacred cows. It has already begun," Mnangagwa said, adding his government would heavily descend on crime. Zimbabwe, Mnangagwa said, would also capacitate security agencies to plug illicit mineral flows, through the country's porous borders. "In spite of the fact that the fiscus continues to be robbed of potential revenue through rampant smuggling of minerals through our porous borders by a network of foreign and local criminals, government is going to capacitate state agencies to stop the illicit flow of minerals through our porous borders," Mnangagwa said. "We must fix porous borders on gold illegal exports. To capacitate agencies to clampdown on practice." Zimbabwe's opposition political parties, as well as the international community, particularly the European Union and United States, have encouraged Mnangagwa's administration to ensure that next year's polls are credible. Zimbabwe's last elections, which were won by Zanu PF then led by former president Robert Mugabe, were disputed by the country's opposition parties. Mnangagwa said his government had introduced a US$10 million incentive support facility to boost the country's dwindling exports. The support facility will cover a range of commodities that include gold, tobacco and soya beans. Zimbabwe, he said, would also work towards promoting the "beneficiation of primary commodities." 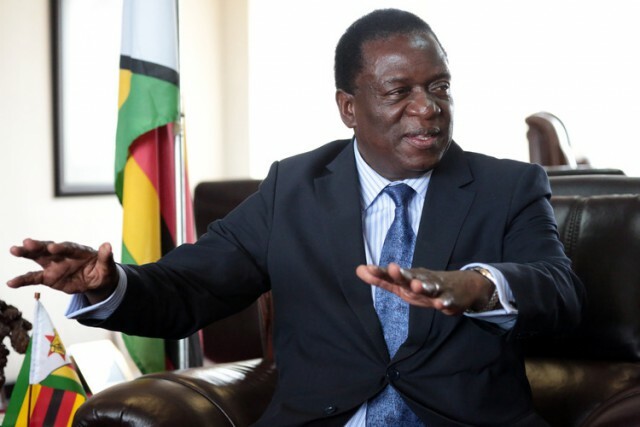 Mnangagwa said Statutory Instrument (SI) 64 gazetted by government to restrict the importation of basic commodities had given the manufacturing sector room to grow. He said government was tailoring "a national local content policy" to ring-fence the local manufacturing sector which has struggled amid the proliferation of cheap imports. "Recent surveys undertaken during the period under review reveal that the manufacturing sector grew. Government will continue to facilitate a conducive environment for the sector to grow." "I appeal to our business community to stop wanton price hikes," he said, adding the government would swiftly act to cushion consumers from parasitic business bent on profiteering. "We would soon be winding up the commercialisation of state enterprises which have been an albatross on the neck of government," Mnangagwa said.